A recently released study reveals that two-thirds of Fortune 100 companies are not mobile-optimized for Google, and 97% of top U.S. retailers fail to follow several mobile optimization guidelines. In a multi-screen, multi-platform and increasingly mobile world, this means lost business opportunities for your business. Your web design firm should address these mistakes immediately and implement an integrated desktop and mobile SEO strategy in order to maintain your visibility on both desktop and mobile SERPs. Below are a few of the most common mobile optimization mistakes you could be making, or you may have missed in your last website audit, and tips on addressing these mistakes. Use this as your starting point to see if your website needs mobile optimization, and talk to us immediately if you find one or more of these mistakes on your site. 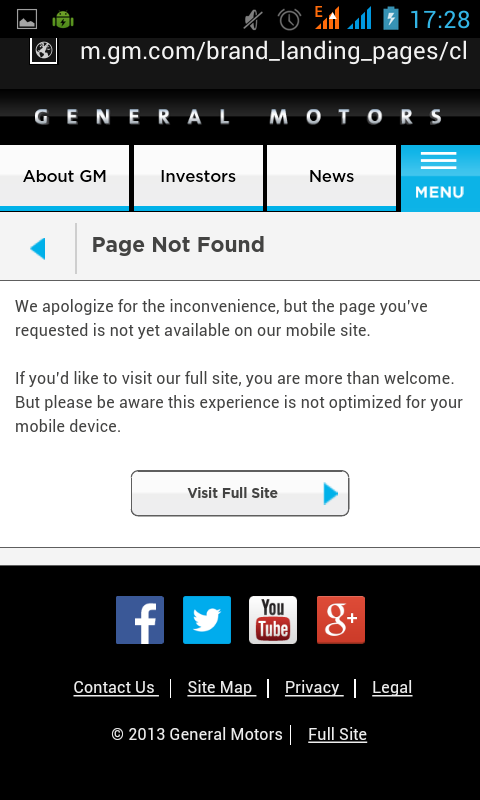 A non-existent page, which leads to an error 404 page. 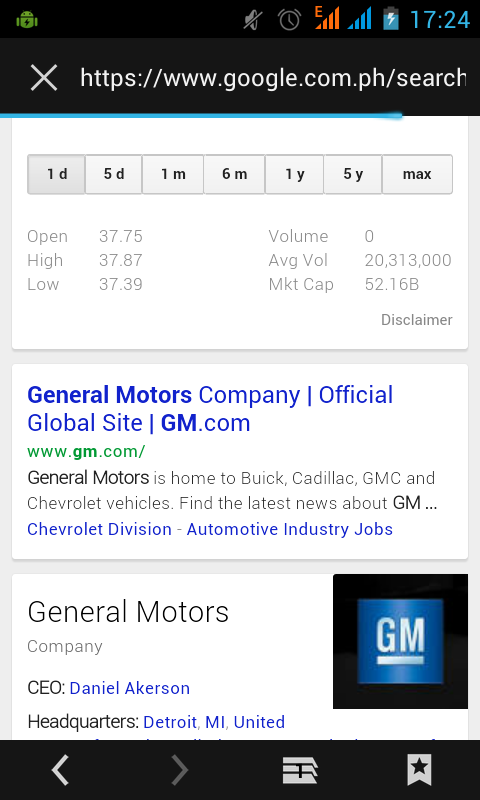 In the example above, the GM website appears on top of Google SERPs after the Knowledge Graph result (image 1), but when you click on the “Chevrolet Division” link, it leads you to an error page (image 2). How to Fix This: Make sure to check your mobile redirects. If you have a mobile version of your desktop website, let us know and we will set your redirects to the mobile versions in case the search originates from mobile. If you do not have a mobile-friendly version of your site yet, serve the desktop version. This way, your visitors still get relevant content instead of being redirected to an error page. 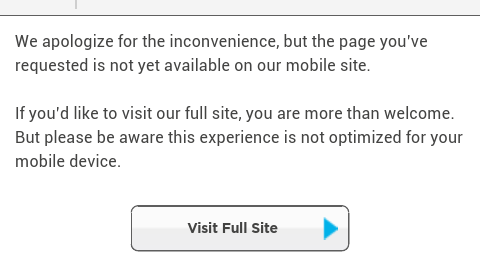 How to Fix This: Check your configuration and have your desktop pages redirect to the proper mobile counterparts. Develop a mapping scheme that makes it easier for dynamic desktop pages to redirect to the proper mobile website versions in order to avoid this redirection error. As with the previous item, if you do not have a mobile-friendly version, serve your users the desktop version of the page. This happens when your website sends Googlebot on an infinite redirect loop because of any of the errors mentioned above, because of missing headers and tags that identify each page properly, or because of improper URL mapping from desktop to mobile. Key pages of your site may not be indexed properly as a result of this error, which is why it’s important to address this immediately upon detection. How to Fix It: First, you need to find out if your website is handling Googlebots incorrectly on mobile. Request a website audit that includes mobile functionality from us and we will tell you if your site is sending Googlebots on an infinite loop for specific pages. You’ll need to do the fixes discussed in the items above to get started. You also need to check your URL mapping scheme in order to ensure that all desktop pages redirect to their corresponding mobile versions properly. It’s important that you address these mobile optimization issues and prepare your website for mobile as your audience moves to different platforms. We’d be happy to help you fix these common errors. Talk to us today about your mobile web design and we’ll start with your complete website audit to learn what we can improve.